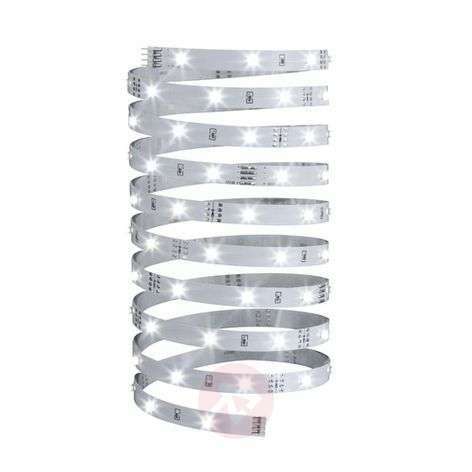 The 150 LEDs which are built into the five metre long LED strip shine with a cool white light. A decorative illumination of walls, shelves, furniture or stairs can be realised with the strip. The strip can be shortened at intervals of 10 cm, and the separation points are marked on the strip. A variety of shapes can be formed using the wide range of accessories, such as straight connectors, corner or X-connectors, corner profiles etc. Even two cut-off LED strip elements can be connected to one another again using clip-to-clip connectors, which also increases the flexibility. The beam angle of the LEDs is 120°. The power supply necessary for the connection and the remote control required for operation are available as accessories and must be ordered separately. The accessory you are referring to is under item Nr. 7600699. There are other accessories available for this unit as well.